Last Friday, I was so enthusiastic about Rethink Robotics’ Sawyer, I even ran to my colleague Vincent Duchaine and asked him to set aside some funds. I then paid premium price for a last-minute airplane ticket to Chicago. After all, I didn’t want to purchase yet another robot without at least seeing it (actually bumping it). 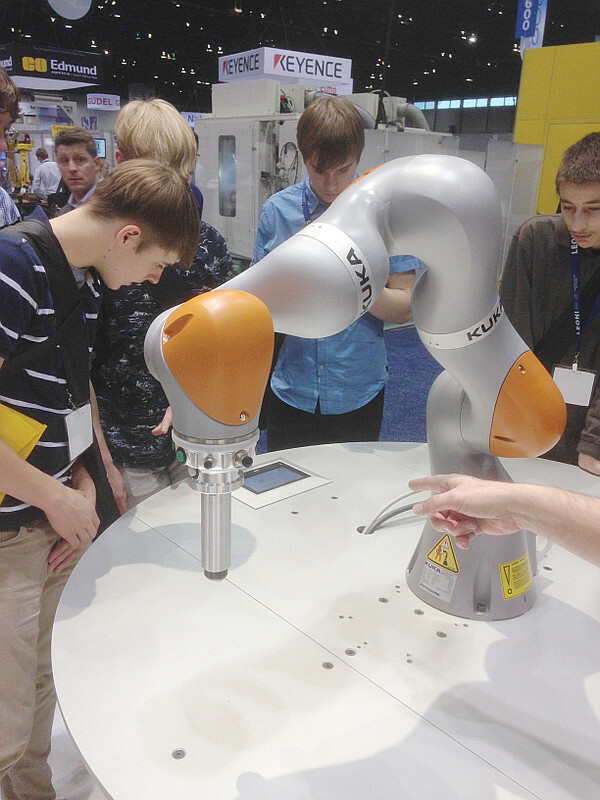 The company later twitted that they will release their US$29,000 robot arm this summer. So I won’t see it in Seattle at ICRA 2015 either. Hopefully, Rethink will at least release by then some data on repeatability and photos of the robot’s controller. Sensors, bearings, gearboxes, and the like, a lot of integrators, many distributors, and plenty of UR5s and FANUC robots. A lot of attractive female employees offering free pens and bags too. (Why?!) And few engineers who know how their products work. One of the exhibitors didn’t know how to restart his robot… Another tried to convince me that his robot is collaborative just because it was programmed to move slowly. Fortunately, as this was my third Automate show and I didn’t need any pens, I knew where to go. But I forgot to stop by Modbot’s booth and see their low-cost modular robot arm, which can easily pass for a collaborative robot. 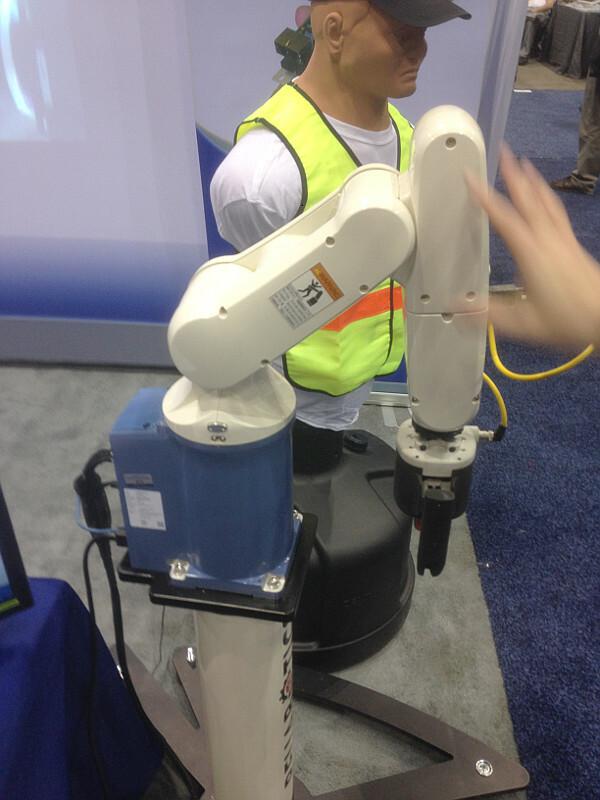 I had some fun at Precise Automation’s booth unsuccessfully trying to mess up with their PAVP6 collaborative robot. The robot didn’t mind my repetitive interventions and continued stubbornly to hit a defenseless dummy with no more than 100N. The robot is incredibly compact, and one of Precise Automation’s partners had developed a nice GUI on a tablet. My only concern is that the arm (a VP-6242G made by Denso) was introduced more than ten years ago. How much longer will Denso continue to supply this arm? Another interesting stop was at the booth of MDA, the creators of the Canadarm. The company had replaced UR5’s controller with their own (to Esben Østergaard’s dislike), added an ATI force/torque sensor and made the robot easier to use and more self-aware: hand guiding and mechanical interference avoidance. Unfortunately, the hand guiding was far from perfect, and by perfect I mean KUKA’s iiwa performance. Obviously, the communication rate was too slow. Then, I had a chat with Michael Gerstenberger, the main KUKA iiwa expert in North America, who did our own iiwa training. He showed me KUKA’s latest media flange (Pneumatic Touch) with two buttons, and I immediately regretted that I didn’t wait for this new interface. The interface, with a colourful LED ring reminds me a lot of that of Gomtec’s Roberta. A few minutes later, Erik Nieves proudly showed me Yaskawa’s BMDA3 dual-arm collaborative robot designed for the biomedical industry. Great design for some applications, and very rigid too, but pretty expensive. The robot has an endoskeleton design, so that its covers serve no structural purpose. None of its motors can output more than 80W. The payload of each of its arms is 3 kg, and repeatability is 0.1 mm. This is certainly the perfect robot for a hospital pharmacy, for example. Of course, I spent most time bumping each of the four UR3. In fact everyone does that, so it’s amazing all robots still work on this fourth day of the show, as seen on Twitter. I’m sure that Universal Robots now regrets the choice of this demo, which consisted of one master and three slaves, because each time you stop the master, all four robots stopped until a knowledgeable employee, like Esben himself (between two interviews), reset the system. Anyway, the UR3 is really nice looking, there is no doubt. It will certainly end up in many commercials and, of course, in many factories too. The robot is pretty harmless, compared to its big brothers. In fact, you can even move the robot when it is braked (good luck doing this on a UR5), which is probably not advisable. Naturally, many other companies were there too and I certainly missed one or two novel products, but I had only a couple of hours to look around. For example, I didn’t check Mitsubishi’s collaborative robot, which is essentially a standard industrial robot with a safety option. There were quite a few parallel robots too, including Adept’s Quattro and many Deltas, but I was very much impressed by how fast some of today’s SCARAs can go. I’m still undecided about which technology is better for fast pick and place operations after seeing Stäubli’s TP80 fast picker. It was a nice surprise to see Asyril’s pocket Delta robot and talk to Alain Codourey, the firm’s CEO. Asyril’s pocket Delta is amazingly tiny and handles pieces that are smaller than 1 mm in diameter. This is one of the nice examples where automation doesn’t steal anyone’s job. Physik Instrumente (PI), a leader in the field of precision hexapods, also made their first appearance at Automate. They had three hexapods to show, but I don’t think Automate is the right show for precision alignment devices. 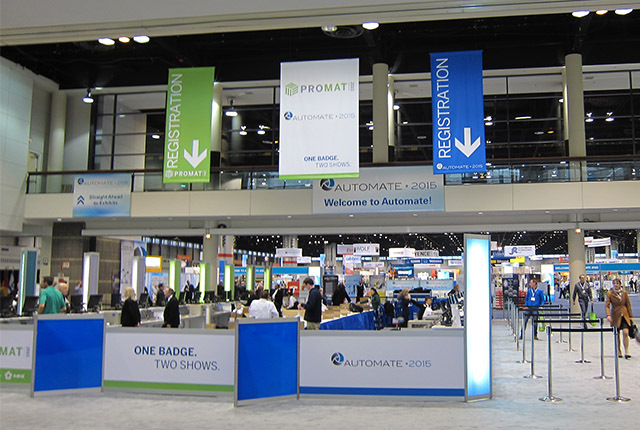 There is no doubt that Automate is the best show in North America if you are looking for your first robot. However, for researchers like me, IEEE ICRA’s Exhibition remains the most exciting shopping place. The next one will be in Seattle and I have already booked my airplane ticket.